Our previous analysis of Real-Time Bidding can be found here. Since then, we worked hard on this issue. As the above linked description states, RTB works as follows: (1) user enter a publisher's site (2) Ad Exchange sends bid requests to its bidders, for this ad impression (3) bidders send their bids (4) the winner serves an ad. However, what does happen in these points? We studied Bidders, Ad Exchanges and the relationships between Ad Exchanges and Publishers. We used two approaches, directly measuring the value of user data in RTB auctions, as well as referring to community input using our YourValue project. The price in RTB depends on the sites. Certain sites are more valuable than others. Profiling impacts prices. The prices for profiled users can be 2-5 times higher than in the unprofiled case. The price again depends on the physical location. The YourValue users differed significantly by average price in RTB. Transparency. More than 80 bidders found. Ad Exchanges provide various information on their users, to the bidders. Among the information in the bid requests may be: the IP address (or part of it), inferred user income, gender, even racial profile. Bidders then appraise this data and submit their bids. So one user may be more costly then another. The incomes of Ad Exchanges obviously depend on the bidders. So some of them may earn less than others in certain circumstances and we also studied these money flows, which we show here. 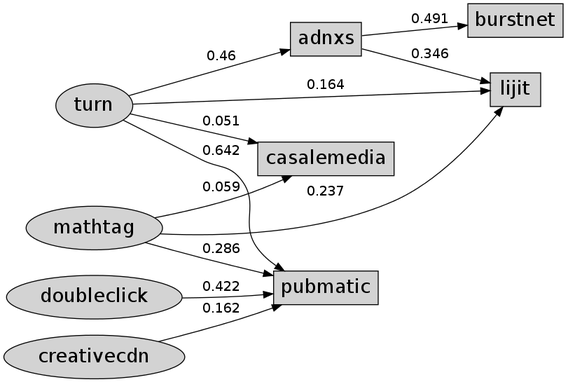 The image below shows flows of ads - the oval shaped nodes represent the bidders, while the rectangles are Ad Exchanges. The values on edges are the average prices paid by a particular bidder, to a particular Ad Exchange. This study is solely done using the information leak in RTB systems. The next flow is done for all RTB ads communications. 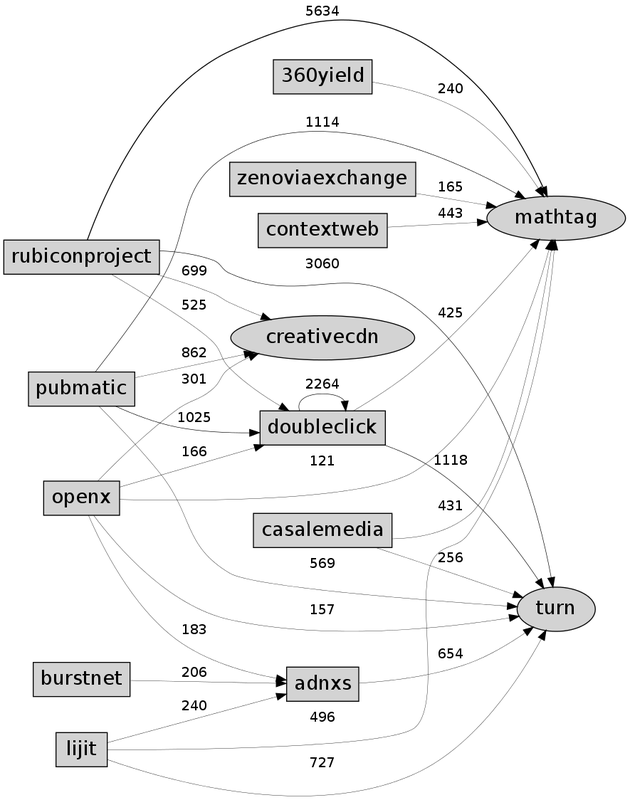 It shows the numbers of ads sent by an Ad Exchange to a particular bidder who won the auction. We counted all events of auction wins and this is the number shown on the edges between the nodes. As is seen, some bidders are more active than others. Consequently, those more active obtain more user data. The rectangle-rectangle node connections means that a bidder who has its own Ad Exchange, won a bid at another Ad Exchange's auction. We also encountered interesting ties between Ad Exchanges and publishers, which result in privacy and security risks. We prepared a separate description on this case, which can be found here.